After Fort Jefferson was built, the war-fighting technology had advanced so much that the design of the fort was almost entirely useless for participating as a battle fort. Instead, the fort began to be used as a military prison during the Civil War. Most of the prisoners were military rebels from the Union army. The most famous prisoner on the Fort, however, was a person who was accused of complicity and conspiracy in the assassination of President Abraham Lincoln. The man was Dr. Samuel A. Mudd, who was in contact with Lincoln's assassin, John Wilkes Booth, a few weeks before the infamous assassination. Following, the assassination, the assassin Booth ran to Dr. Samuel Mudd's residence in Maryland, about 30 miles away from Washington, DC, and got his broken leg repaired, as well as spending the night in the Mudd residence. Along with 8 other people, Dr. Samuel Mudd was convicted of conspiracy in the murder of President Lincoln. Him and four others were spared the death sentence and instead given a sentence of life in prison. 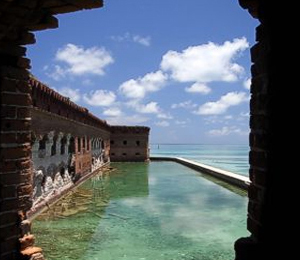 The men were sent to the Dry Tortugas where Fort Jefferson was being used as a prison. After an attempt to escape by stowing away on one of the ships, but he was quickly found and his life on Garden Key being even more dreary. However, an epidemic of yellow fever began to spread and the prison's physician died from the disease. Dr. Mudd also acquired yellow fever but he quickly recovered and began to help people at the fort. He was single-handedly able to help the prisoners recover from the deadly epidemic. Because of his great aid during the dark time of the epidemic of yellow fever, some of the prisoners and workers at Fort Jefferson wrote a letter to the federal government informing them of Dr. Mudd's crucial role in saving most of the population at the fort. President Johnson himself put forth a pardon for Dr. Mudd, effectively calling for his release from the prison. After his release, Dr. Mudd successfully reoriented himself into his old community of Bryantown, Maryland, joining in city politics and even having a 9th child.